PETER PANZERFAUST #1, the debut of the new Image Comics series that merges Peter Pan with a World War II adventure story, has sold out after being released in stores on February 14. It will immediately return to press for a second printing (JAN128112) due in stores the same day as PETER PANZERFAUST #2 (JAN120599), March 14. In the first issue of this new ongoing series by Kurtis Wiebe (GREEN WAKE) and Tyler Jenkins, French orphans in Calais, a French city that has been heavily bombed by the Germans, encounter a charismatic American soldier. Inspired by his esprit, the boys find themselves trusting him with their lives - and learning that they can perform feats they would have never thought possible. 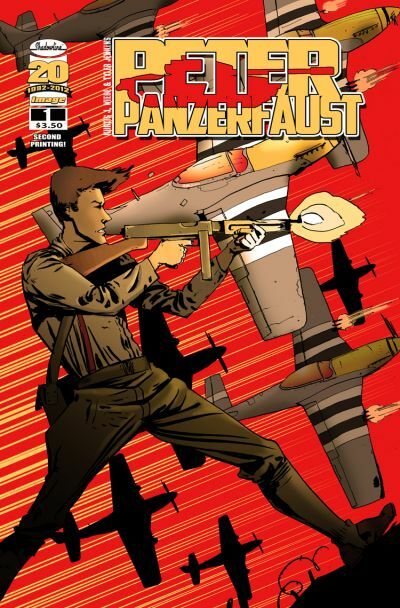 PETER PANZERFAUST is a monthly, full-color comic book series published under Image Comics’ Shadowline imprint, available in comic book stores and multiple digital outlets.